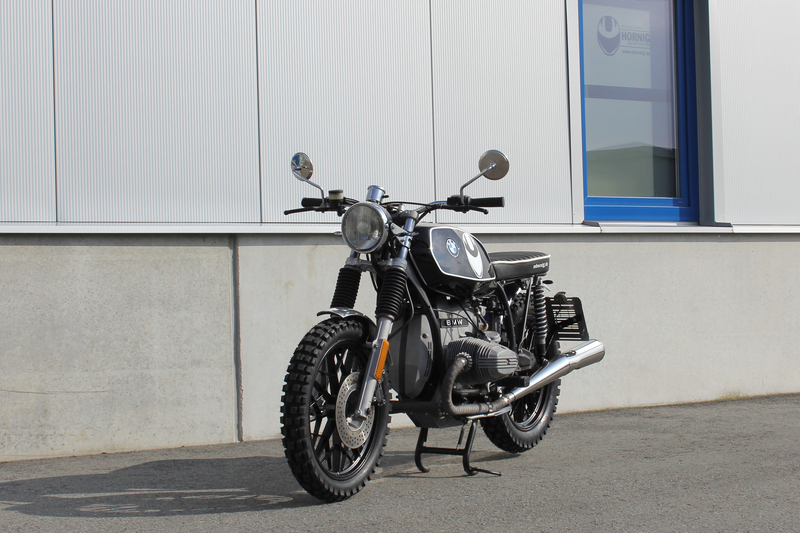 After our successful R1100R scrambler and R1100GS scrambler conversions of the last years, we again started a scrambler project this year. 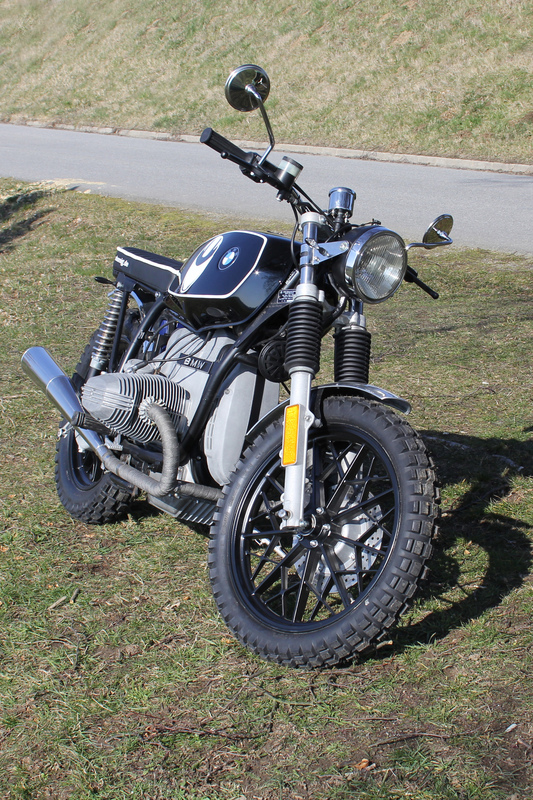 We decided that this time a BMW R45 (model year 08/1979, 69.000 km, 1.700 EUR) should be transformed into a scrambler and thereby be embellished. 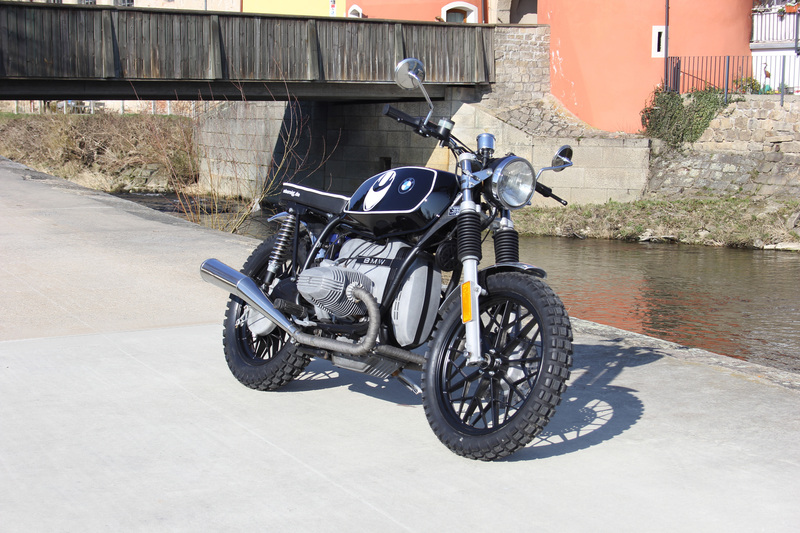 Again, the aim of the conversion was to get a TÜV approval for the motorcycle and nevertheless leave as many unnecessary pieces as possible. 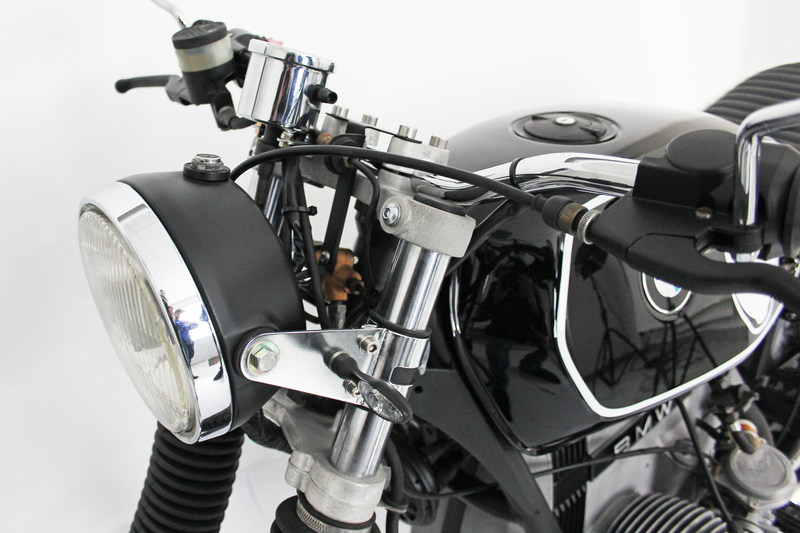 First, we removed the crashbar that was mounted on our R45 as well as the back foot-pegs and the luggage carrier. 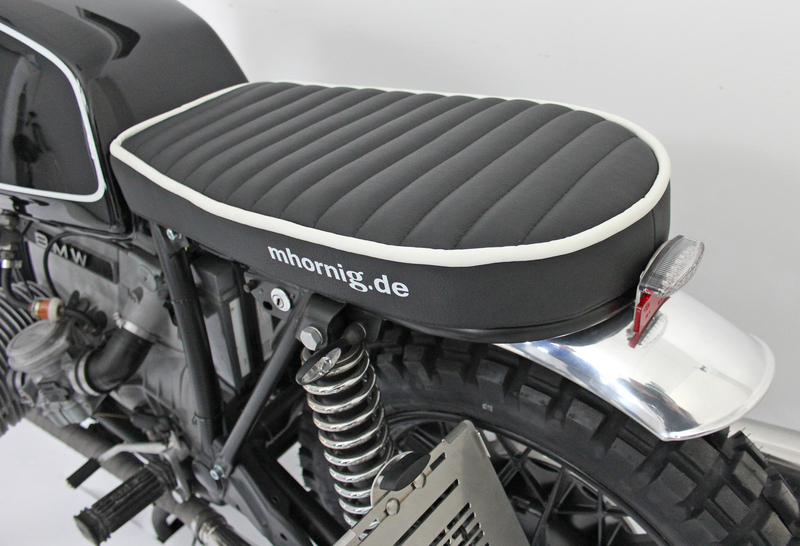 The rear section of the motorcycle was shortened and a new single seat was individually built for our R45 conversion (ca. 280 EUR). We removed the fuse box and installed it again later under the tank so that it is very unremarkable now. The engine of our R45 already had a quite used look. Therefore we used dry ice blasting in order to make it look great again (ca. 200 EUR) and set visual focuses by painting some parts of the engine in black colour. The frame of the motorcycle was revarnished and blazes in new black shine now. 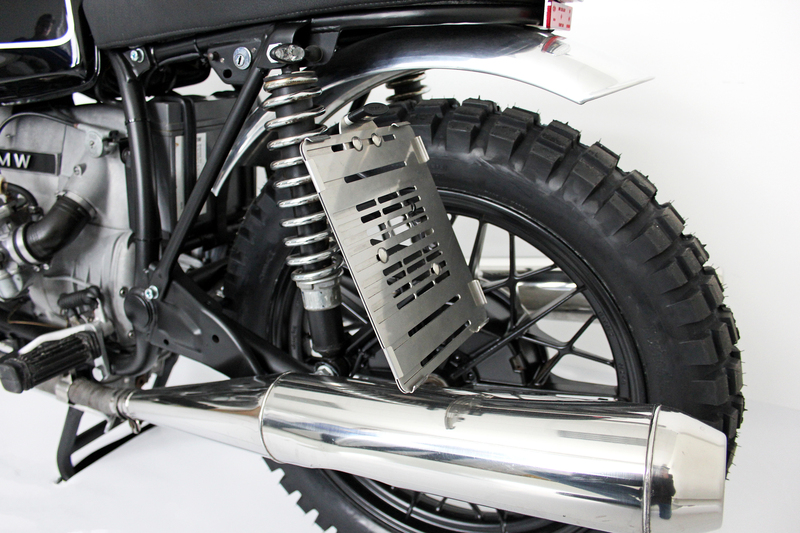 The fork of the R45 was equipped with a rubber boot on the left and the right side (article no. 3142115, 25,90 EUR per piece). 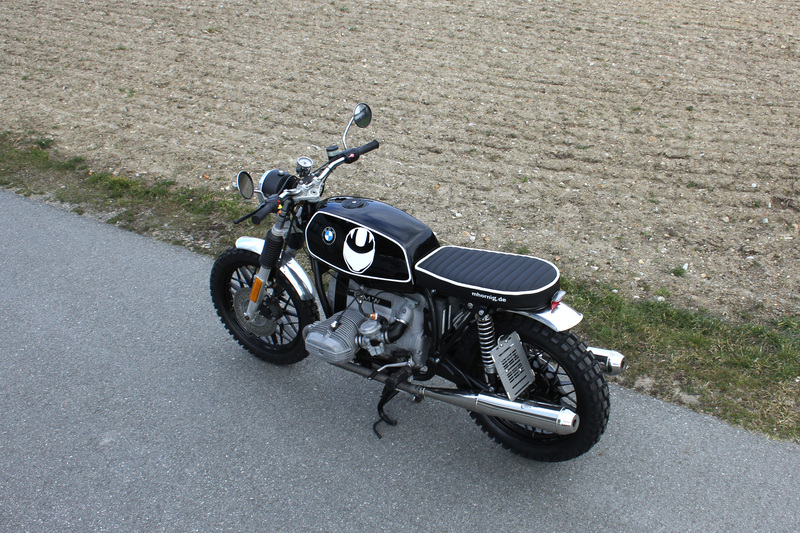 The big original instruments of the R45 were replaced by a small round speedo with control lights (49 EUR). Because of the removal of the original instruments, we needed a new holder for the headlight (19,99 EUR) and the ignition lock was integrated into the headlight by our mechanic. We replaced the original fenders by some mudguards made of aluminium (79,95 EUR and 99,95 EUR) and we wrapped the exhaust manifold with a special heat protection tape (2x 29,99 EUR). Our R45 also got a new handlebar (ca. 60 EUR) where we then mounted new, shorter mirrors (article no. 5116021 and 5116022, 21 EUR per piece). The original front and rear indicator lights were replaced by mini LED indicators (article no. 1272/12Hk, 129,90 EUR per set) and a new rear light (29,95 EUR) along with a self-made rear light holder was mounted as well. Moreover, our scrambler got some lugged tyres (front: Continental TKC80 Twinduro M+S, 1.85x18, 85 EUR; rear: Continental TKC80 Twinduro M+S, 2.5 x 18, 105 EUR) and new handle rubbers (article no. 3272811 and 3272812, 9,90 EUR and 10,90 EUR) as well as new rubbers for the driver footrest (article no. 4671660, 16,70 EUR per piece). 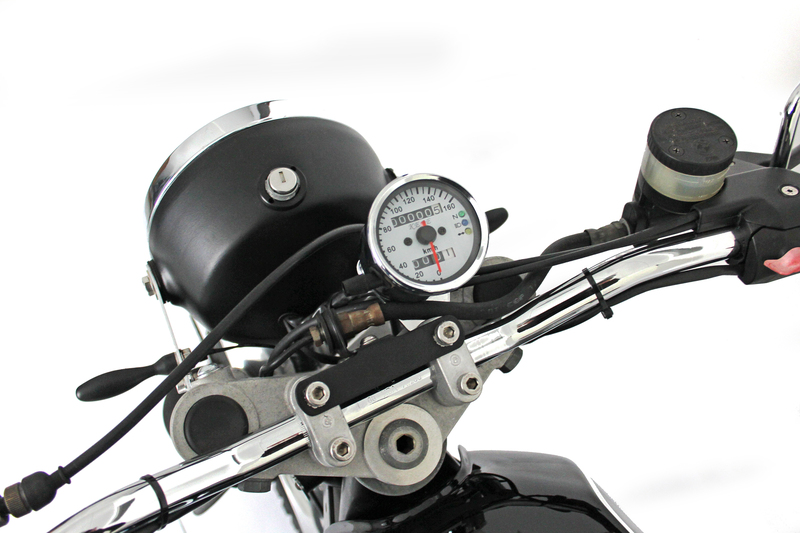 The original number plate holder could, due to the truncation of the rear section of the motorcycle, not be used anymore. Therefore we developed a new, special holder which was mounted laterally onto the R45. We then mounted our adjustable license plate bracket which is made of stainless steel (article no. 18-28, 29 EUR) and a license plate light (14,99 EUR) onto our self-made holder. 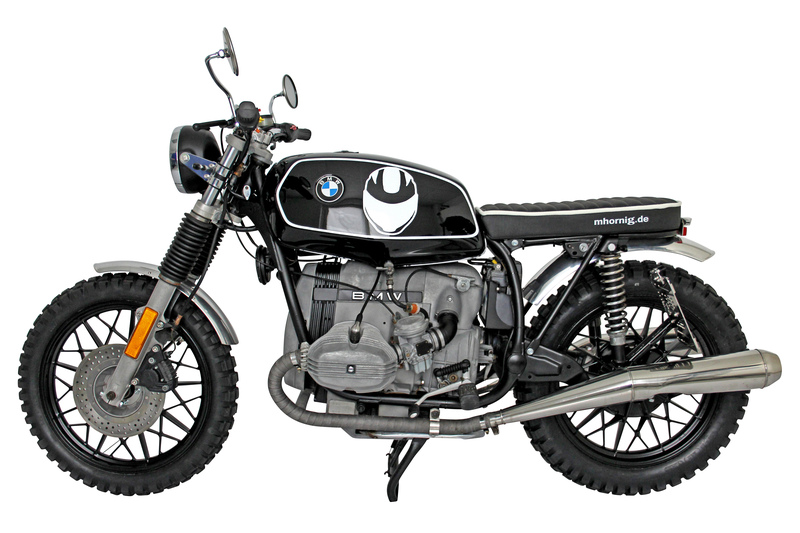 The rims of our R45 were cleaned by sandblasting and powder coated in black colour (65 EUR per rim) and the tank was varnished in black and manually provided with white lines (ca. 300 EUR). Moreover, we equipped the tank with our company logo in white colour. The vehicle and all parts we mounted onto it were examined by German TÜV and were said to be roadworthy. 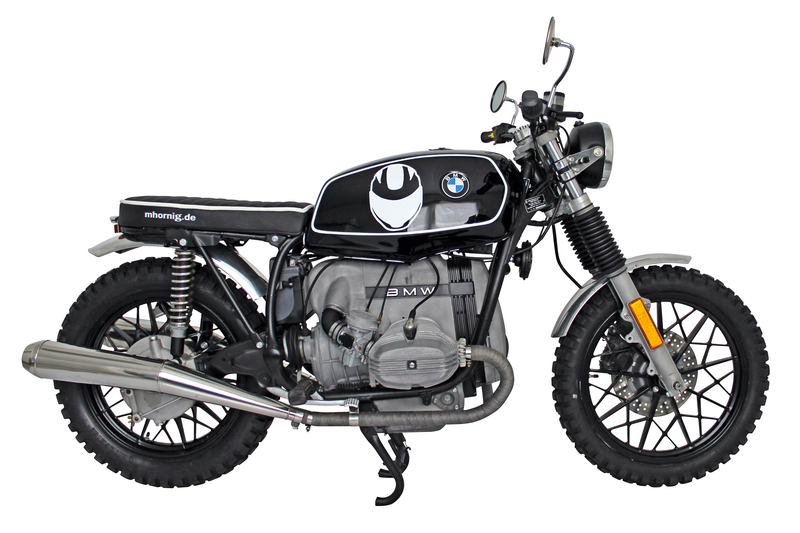 Our BMW R45 scrambler conversion is another unique vehicle as well as lots of the parts that we have mounted onto the scrambler. Some parts were newly or further developed in order to meet our requirements. The conversion is intended to be used as a template or inspiration. We would be pleased about a reproduction or a development. We cannot guarantee that you will receive an approval from all Technical Inspection Agencies (in Germany: TÜV, Dekra or GÜT) with this conversion. The experiences which we made with our other conversions are reflected here. 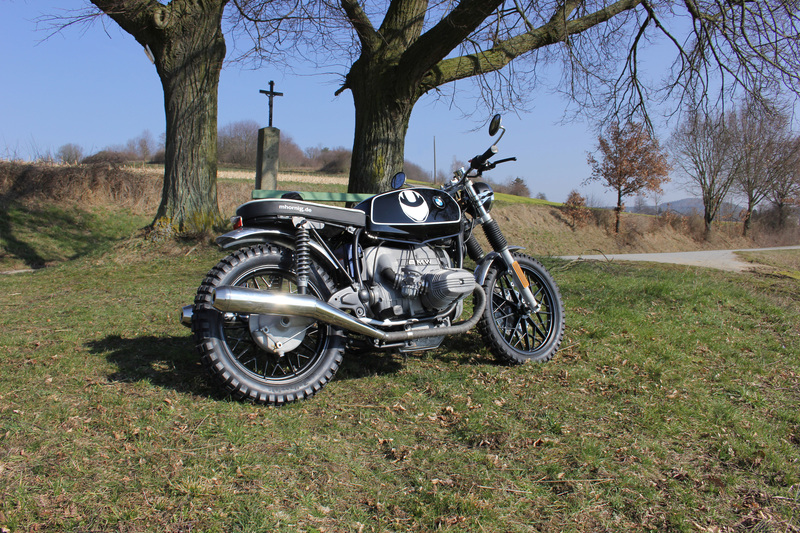 Prior to the start of the rebuilding we contacted the TÜV in Cham, Germany again to clarify whether we had to pay attention at something special at our R45 conversion. The total conversion amounted to approximately 3.700 EUR and was realized in about 50 hours. However, the sometimes difficult research and organization work and the procurement of the parts are not included in the calculation.